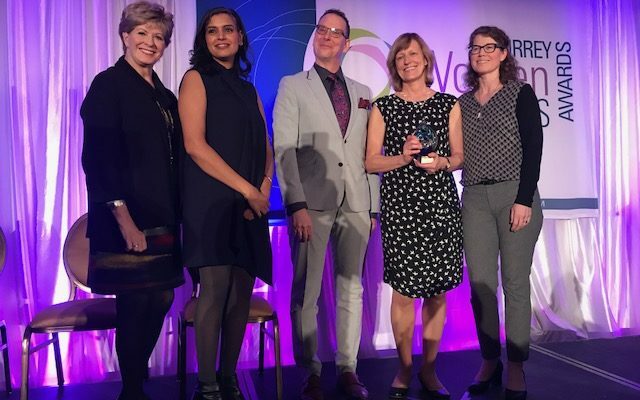 Our ED, Ingrid Kastens, won the 2018 Surrey Board of Trade’s Not-for-Profit Leader award at the 9th Annual Surrey Women in Business Awards Luncheon. “On Thursday, March 8, 2018, the Surrey Board of Trade host[ed] the 9th Annual Surrey Women in Business Awards Luncheon. The event recognize[ed] the hard work of Surrey’s businesswomen and their contributions to Surrey. The event’s philosophy has been rooted in the purpose of educating our audience. Some of the best and brightest women of Surrey’s business community [were] celebrated and receive[d] well-deserved recognition. The purpose of the event [was] to inspire, motivate and educate the audience” (https://businessinsurrey.com/events/surrey-women-in-business-awards/). To see Ingrid’s nomination video, check it out on our YouTube channel!